The American mezzo-soprano Helene Schneiderman was born in Flemington, New Jersey and began her studies at Westminster Choir College, Princeton. She completed a Master of Music in Voice Performance at the University of Cincinnati College of Music and went on to gain an Artists’ Diploma in Opera in 1981. After graduating, Helene moved to Germany, where in 1982, she joined the Heidelberg Opera Ensemble and since 1984 has been a member of the Staatstheater Stuttgart. As well as her work with Stuttgart, she has made guest performances with many major European and American Opera Companies including Munich State Opera, Karlsruhe, Düsseldorf, Hamburg, Orlando, Florida and New York City Opera. From 1982-1987, she appeared regularly at the Heidelberg Schlossfestival and appeared at the Rossini Festival in Pesaro in 1990. 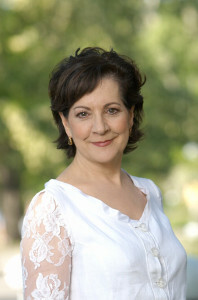 In 1998 Helene Schneiderman was given the prestigious title of Kammersängerin from the City of Stuttgart. At the time, she was the youngest singer ever to have been so honoured. She made her debut at the Salzburg Festival as Zweite Dame DIE ZAUBERFLÖTE, conducted by Bernard Haitink. Other prominent conductors with whom she has worked include Leonard Bernstein, Dennis Russell Davies, Giuseppe Patané, Sir Georg Solti and Alberto Zedda. As well as her operatic commitments, Helene has developed a varied concert career and has appeared widely in oratorio and lieder recitals, most notably at the Beethoven Festival, Bonn, in 1989 when she sang Arias and Barcarolles by Leonard Bernstein in the presence of the composer. She has also recorded the Eight Poems of Emily Dickinson by Aaron Copland on compact disc with the orchestra of St. Luke’s under Dennis Russell Davies. In 1990, she appeared as Smeaton ANNA BOLENA at the Concertgebouw, Amsterdam and repeated her interpretation of the role at the Vienna Konzerthaus in 1994 alongside Edita Gruberova. For the 1994-95 season, she returned to the Concertgebouw to sing Queen Henrietta I PURITANI, conducted by Jan Latham-Koenig. In Stuttgart, she has had much success, most notably as Penelope in Monteverdi IL RITORNO D’ULISSE IN PATRIA, as Rosina IL BARBIERE DI SIVIGLIA and the title role of CARMEN. In the 1995/96 season, she made her debut at the Royal Opera House Covent Garden performing Cherubino LE NOZZE DI FIGARO, with a cast that included Cheryl Studer and Barbara Bonney, conducted by Bernard Haitink. She also sang Suzuki MADAMA BUTTERFLY for the New Israeli Opera Tel Aviv and made her role debut as Isabella L’ITALIANA IN ALGERI in Stuttgart. In the following seasons, she returned to the Salzburg Festival, Royal Opera House, Covent Garden for Dorabella in Jonathan Miller’s acclaimed production of COSÌ FAN TUTTE, and in Stuttgart, she sang among others Meg Page in Johannes Schaaf’s new production of FALSTAFF, Bradamante in Jossi Wieler’s new production of ALCINA, Ottavia L’INCORONAZIONE DI POPPEA and a highly successful role debut with the title role in GIULIO CESARE. She has recently made her debut with the Opéra National de Paris in two runs of DIE ZAUBERFLÖTE and has also returned to the Royal Opera House, Covent Garden for further performances of Dorabella COSÌ FAN TUTTE, conducted by Sir Colin Davis as well as to the Salzburg Festival for a highly acclaimed Marcellina LE NOZZE DI FIGARO. She made two very successful debuts with Seattle Opera as Olga EUGENE ONEGIN and with San Francisco Opera, where she sang Bradamante ALCINA and returned for a much-acclaimed Rosina IL BARBIERE DI SIVIGLIA. Upcoming 2017 engagements include DER ROSENKAVALIER at the Metropolitan Opera and EUGENE ONEGIN with Canadian Opera Company. Helene’s 2016 engagements included a return to Royal Opera House for THE NOSE, her debut with Santa Fe Opera as The Old Baroness VANESSA and Marcellina LE NOZZE DI FIGARO for the Canadian Opera Company. Recent role debuts include Nicklausse LES CONTES D’HOFFMANN for Seattle Opera; Flora LA TRAVIATA at the Salzburg Festival (in Willy Decker’s new production, conducted by Carlo Rizzi); Emilia OTELLO, Despina COSÌ FAN TUTTE and Genevieve PELLEAS ET MELISANDE both in Stuttgart, Suzuki MADAMA BUTTERFLY, Larina EUGENE ONEGIN in Valencia, Annina DER ROSENKAVALIER for both Teatro Real, Madrid and Teatro alla Scala, Milan and for her San Diego Opera debut, in addition to her regular performances in Stuttgart. Recent roles include Mrs Darling in the world premiere of Richard Ayres’ PETER PAN at Staatstheater Stuttgart, Annina DER ROSENKAVALIER for the Glyndebourne Festival and BBC Proms and Marcellina LE NOZZE DI FIGARO for Teatro Real, Madrid.